The main objective for treatments of diabetes is prevention of hyperglycemia and reduction of protein glycation to avert complications. The success of treatment is commonly monitored via Hb A1c levels. Furthermore, since diabetes may greatly increase risk for cardiovascular diseases, it is essential to control blood pressure and cholesterol levels as part of the treatment regimen. Here, we mainly discuss the pharmacological treatment options for managing blood glucose levels. The strategies discussed include altering specific functions in glucose homeostasis using small molecule drugs and/or including specific hormones and/or its analogs to enhance their levels and functions. Treating type 1 diabetes: The treatment for type 1 diabetes is administration of insulin via injection or pump (see Insulin in Figure 1). Short-acting and long-acting insulins are typically used in combination. Long-acting insulins direct a basal level of sugar uptake by cells throughout the day, while short-acting insulins cover glucose level increases following meals. Learn more about designer insulins here. Increasing insulin secretion may be accomplished by various classes of drugs. Some drugs increase release of insulin stored within the pancreatic β-cells, while other drugs promote insulin production and release. Increasing insulin function can enhance glucose uptake and utilization thereby facilitating lowering of blood glucose. Decreasing glucose production from liver stores of glycogen can reduce elevated blood glucose levels after overnight fasting. Decreasing glucose absorption from the food can be accomplished by blocking the breakdown of starch into glucose. Undigested starch is excreted in feces. Decreasing glucose reabsorption from the kidneys reduces blood glucose levels. Excess glucose is eliminated in urine. 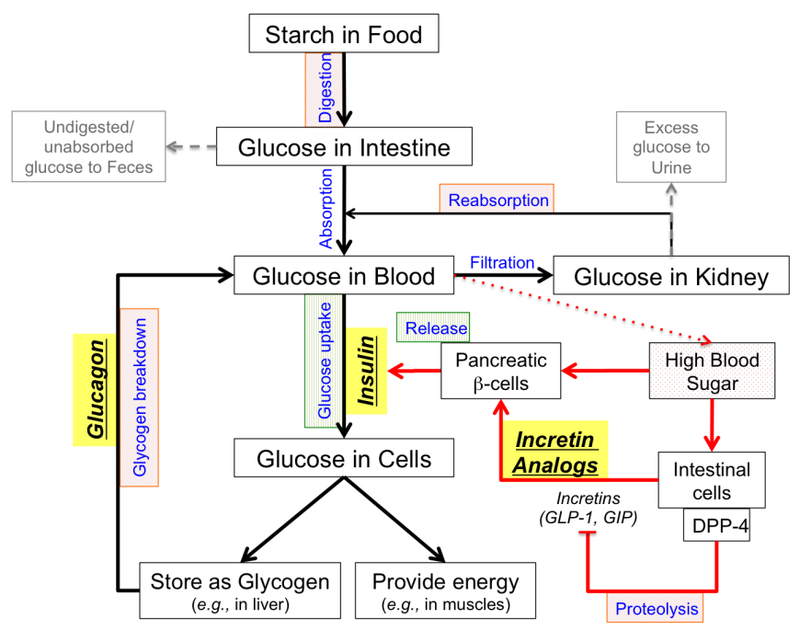 Figure 1: Glucose homeostasis concept map showing strategies for treating type 2 Diabetes. The red arrows indicate how an individual would respond to high blood sugar. Processes targeted for treatment are colored and shaded - processes in green boxes (vertical line shading) are increased in treatment, while processes in red boxes (diagonal line shading) are decreased for treatment. 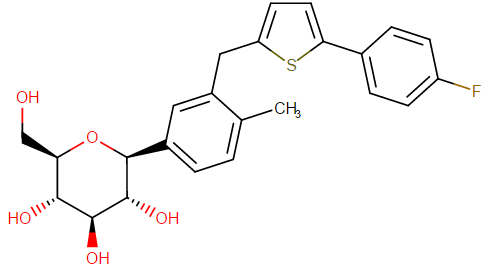 Exogenous hormone analogs used for treatment are shown in bold italics and highlighted in yellow colored boxes. How does the doctor decide which drug(s) to prescribe? If the individual has type 1 diabetes, the only approved treatment is insulin administration. Treatment plans for type 2 diabetes have various options and require careful decision. Immediately after a pre-diabetes diagnosis, the first line of action should be to make lifestyle changes to restrict calories, eat healthier, and exercise more to reduce weight and become active. If these measures fail to manage high blood glucose levels, the first drug commonly prescribed for treating type 2 diabetes is Metformin. The strategy here is to reduce glucose production by the liver and increase insulin sensitivity. If increasing dosage of this drug does not work (or if the individual has renal disease), Sulfonylureas (such as Glipizide) may be added to increase insulin secretion. Other classes of drugs (such as incretins or DPP4 inhibitors or Meglitinides) may also be used to achieve the same result - increased insulin secretion. When increased endogenous insulin fails to manage high blood glucose, the individual probably has severe insulin resistance, and drugs that increase insulin sensitivity (such as Thiazolidinediones) are often prescribed. At this stage, the doctor may also resort to alternative approaches to reducing the blood sugar load (e.g., alpha glucosidase inhibitors can reduce the amount of glucose absorbed from food or SGLT-2 inhibitors can reduce the reabsorption of glucose from kidneys so that the excess sugar is eliminated in urine). Finally, if all these approaches fail, the doctor may resort to adding insulin or completely switching to insulin for blood glucose management. Ideally, diabetes treatment plans should be reviewed every 3-4 months to evaluate whether the prescribed drug(s) are adequate to manage the individual's diabetes. Many factors such as medication costs, access to medications, ability to tolerate the side-effects, and other medical conditions, may play critical roles in deciding the individual's treatment plans. Role(s): Enhances insulin secretion by pancreatic β-cells. Mechanism of Action: Binds to ligand-specific receptor on cytoplasmic face of pancreatic β-cells, mediating closure of ATP-sensitive K+ channel, causing depolarization, and calcium entry into cell, thereby stimulating insulin release. Administration: Take with meals once or twice a day. N.B. : Meglitinides are designed to avoid hypoglycemia that may result as a side of effect of sulfonylurea administration. In comparison to sulfonylureas, they have shorter half-live and are taken at mealtimes to enhance insulin secretion and prevent postprandial (i.e., occurring after a meal) hyperglycemia. Glucagon-Like Peptide-1 Analogs – peptide drugs with a longer half-life than the natural GLP-1 hormone, because they are resistant to degradation by the enzyme dipeptidyl peptidase 4 (DPP-4). Mechanism of Action: Binds to the GLP-1 receptor and stimulates insulin secretion from the pancreatic β-cells; inhibits glucagon secretion and function; delays gastric emptying into the small intestine, signals satiety and thereby suppresses food intake. Administration: Inject peptide daily; now longer acting versions (once a week injections) are also available. Possible side effects: May cause nausea and eventually lead to pancreatitis. Role(s): Enhances insulin secretion by pancreatic β-cells indirectly by prolonging the half-life or action of endogenous GLP-1. Mechanism of Action: Inhibits the enzyme DPP-4, resulting in increased activity of incretins (e.g., GLP-1); leads to increased insulin secretion, decreased gastric emptying, and thus lowers blood glucose levels. Administration: Take orally once a day (at the same time each day). Possible side effects: May lead to pancreatitis. Role(s): Suppresses hepatic gluconeogenesis and enhances insulin action in muscle/fat. Mechanism of Action: Inhibits glucose production by the liver; increases insulin sensitivity, and stimulates glucose uptake in tissues; does not stimulate the pancreas to manufacture or secrete more insulin. Administration: Take orally twice a day with meals. Possible side effects: May cause gastrointestinal complications (e.g., nausea, vomiting) and risk of lactic acidosis, especially in the elderly and in those with compromised kidney function. US FDA approved drugs: Metformin (Glucophage). Also approved in fixed dose combinations with antidiabetic drugs from other classes. 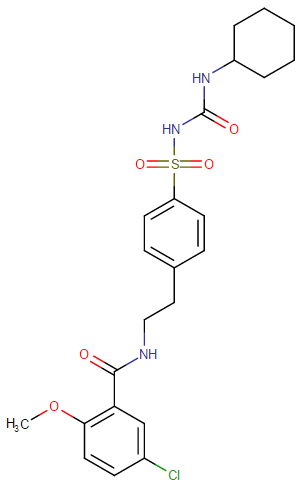 Amylin Agonists – Synthetic analogs of the 37 amino acid peptide, amylin (islet amyloid polypeptide or IAPP), which is cosecreted with insulin by pancreatic β-cells and is synergistic in function in maintaining glycemic control. Mechanism of Action: Inhibits glucagon secretion and lowers preprandial rise in glucose levels; delays gastric emptying, promoting satiety, and thus inhibiting food intake. Possible side effects: Gastrointestinal complications (nausea, vomiting, abdominal pain), headache, dizziness, anorexia, fatigue and coughing. N.B. : This is typically used in adjunction to insulin or metformin. 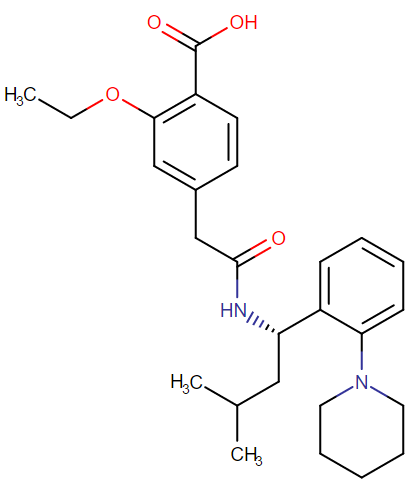 Schematic representation of the primary structure of Pramlintide. 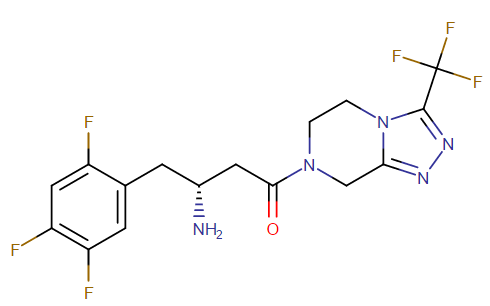 Proline substitution (changed compared to the native Amylin) at positions 25, 28, and 29 (highlighted in yellow) prevents aggregation and amyloid formation. Role(s): Enhances insulin sensitivity in muscle/fat cells, addressing a key problem in type 2 diabetes (i.e. insulin resistance). It also suppresses hepatic gluconeogenesis (i.e. glucose production from lipids and protein components). Mechanism of Action: Acts as agonist of PPAR-γ, lowers insulin resistance and increases glucose uptake by muscle cells. Administration: Take orally once a day at the same time. Possible side effects: Slow onset of action, may increase risk of cardiovascular problems, fluid retention, accumulation of adipose tissue, bone loss. Role(s): Inhibits breakdown of starches in gastrointestinal tract, indirectly reducing absorption of dietary carbohydrates. Mechanism of Action: Works by competitively and reversibly inhibiting α-glucosidase (an enzyme responsible for degrading carbohydrates), thus slowing digestion of carbohydrates and delaying glucose absorption. Administration: Take with first bite of meal. Possible side effects: Gastrointestinal complications (nausea, vomiting, diarrhea). Role(s): Block reabsorption of glucose from urinary tract. Target(s): Na+/Glucose Cotransporter 2 in kidney. Mechanism of Action: Reduces renal glucose reuptake, resulting in an increased amount of glucose excreted in urine. Administration: Take orally once a day. Possible side effects: Polyuria, urinary tract infections, dehydration, ketoacidosis.